Old Girls who were pupils during the 1950s will be greatly saddened to learn of the death of Mrs Ruth Siverns (Miss Bowman) who taught English at the school during that period. She will be remembered with affection as a teacher who combined firmness with patience and encouragement, and whose shining enthusiasm put the oh! into poetry for so many of her pupils. We knew little of her behind the somewhat private façade, certainly not that she had been engaged to marry the poet Philip Larkin. Born in 1927, Marion Ruth Bowman was raised in Wellington, Shropshire, and it was here while still at school and just 16 years old, that she first encountered Larkin. He had not long graduated from Oxford and had arrived in the town to take up the post of librarian at the public library. Though five years her senior, the two were drawn together by their mutual love of poetry, and were often to be seen walking about the town and the wooded slopes of The Wrekin reciting verse to each other. Ruth was later quoted as saying, "He was someone glamorised by an Oxford degree – mature, learned and successful. I was dazzled." The relationship between the shy and somewhat ingenuous young man and the serious-minded schoolgirl deepened during the following two years; and it became significantly more serious in 1945, prompted by Ruth's imminent departure to read English at King's College London. Their love affair inspired some of Larkin's most significant early poems and continued throughout her time as a university student. Following the death of his father in 1948, he proposed to Ruth and they became officially engaged. Larkin, however, found himself unable to give up the "glittering loneliness" which he needed in order to be able to write. Marriage, he said later, was "like promising to stand on one leg for the rest of one's life". He took up a post at the library of Queen's University Belfast in 1950, precipitating a crisis in their relationship, and after much anguish it was decided the engagement should be called off. Perhaps understandably, Ruth destroyed all Larkin's letters to her, more than four hundred of them. It was not long after this crisis in her life that she came to teach at the Girls' High School. But alas, even greater heart-break lay ahead. In 1959 she married a fellow schoolteacher John Siverns, only to be tragically widowed the following year when pregnant with their son, John David. She gave up full-time teaching for spare-time coaching, and later moved away from Wolverhampton to live near Winchester. In 1981, under her married name Ruth Siverns, she published a well-received children's book, Barlow Dale's Casebook (Macmillan), inspired by her love of cats and featuring a famous feline detective and his assistant, Miss Honeyflower. One of the characters, tellingly, lived in a rather posh mansion named Molineux Towers. Later in life Ruth re-established contact with Philip Larkin – who, incidentally, never married - and communicated regularly with members of the Philip Larkin Society, contributing an article, "Philip Larkin at Wellington", for the first issue of the society's journal in April 1996. She died on 31st December 2012, aged 85, in Southampton General Hospital after suffering a bout of pneumonia, and is survived by her son John David. 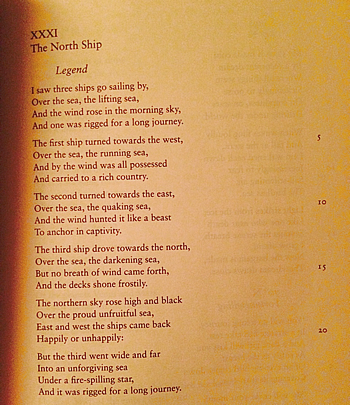 Towards the end of her life Ruth had said of Larkin's poems: "If I look for unlikely favourites I suppose I'd go for The North Ship simply because they are so memorable as I discussed each one with him. Of course they're not very good, often derivative etc. etc. but for me they have something which has nothing to do with their intrinsic literary value or with any perceptive appreciation on my part. I'd choose 'Love, we must part now'."